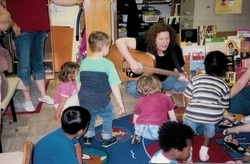 Jammin' With Julie is a fun, entertaining, educational, interactive music program for kids. I am currently teaching private lessons in piano and guitar as well as beginning group lessons that are a great foundation for any musical instrument. Click here for class descriptions.